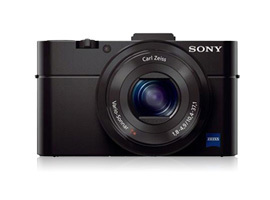 When Sony launched the Cyber-shot DSC-RX100 in June 2012 it was well received for the compact dimensions and handy 28-100mm (equivalent) zoom range, but the main attraction was the imaging performance from its much larger than usual 1-inch type sensor. As the name suggests the RX100 II is this year’s update, adding a number of useful refinements, including a hotshoe (importantly, with provision for a EVF), Wi-Fi with NFC capabilities and a pull-out rear LCD. It retains the 20-MPix pixel count of its predecessor but perhaps the most significant revision to this model is the new back-illuminated (BSI) sensor architecture, allowing a 40-percent increase in low-light sensitivity say Sony. 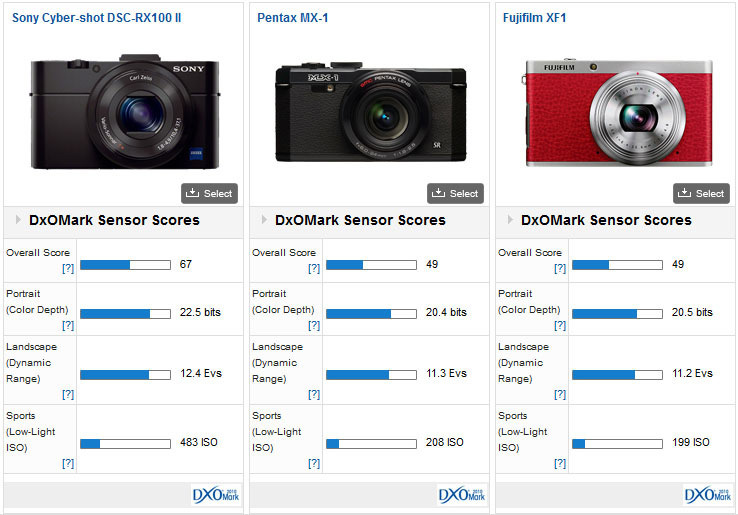 With an overall DxOMarkSensor Score of 67 points, the DSC-RX100 II is ranked 1stwith cameras using a 1-inch type sensor or smaller, and is even ranked highly against those with larger 4:3 sensors coming 4th overall, behind the GH-3, E-M5 and E-PM2. At 22.5 bits, the individual metric score for color depth is one of the best we’ve seen in a high-end compact with a zoom, and one with the largest Dynamic Range. 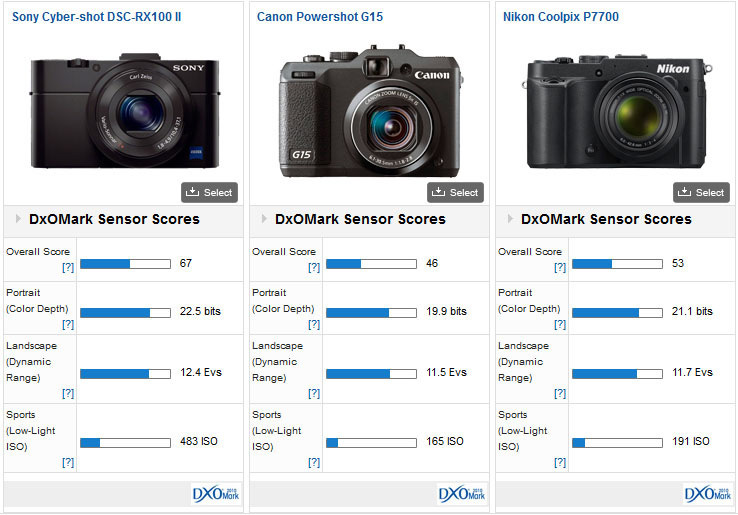 When it comes to low light scores, only compacts with physically larger (APS-C) sensors such as the Canon G1X, Ricoh GR and Coolpix A outperform it. 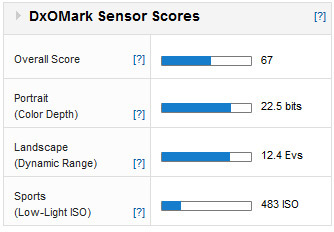 Although Sony says it’s a new sensor when comparing it to the previous iteration the scores are quite similar. While the earlier model featured the same pixel count, only the sensor architecture has changed. In performance terms then, both the color depth and dynamic range remain virtually unchanged, however the new BSI sensor in the Mk II reveals the low-light capabilities are enhanced by +1/3 stop. The physically larger sensor of the RX100 II combined with the BSI architecture means the Sony can easily out-pace the Canon G15 and Nikon P7700 with their 1/1.7-inch type (similarly back-lit) CMOS sensors. This is particularly noticeable in the low-light ISO score where the Sony is around +1.3 stops ahead of the two rivals. As for color depth, the Sony has a comfortable lead of +1.67 stops over the G15 and +1 stop over the P7700. Dynamic range isn’t quite as impressive but the Sony still leads here too. It has around a +1 stop improvement at base ISO over the G15 and +1.3 stops over the Nikon P7700. We also had the opportunity to compare the RX100 II with the more consumer oriented Pentax MX-1 and the Fujifilm XF1 (which boasts a larger 12Mpix 2/3-inch type EXR CMOS sensor than the 1/1.7-inch type 12Mpix backlit CMOS sensor of the MX-1). Against both models, the Sony has around a +1 stop advantage in Dynamic Range and low-light rising to around a +1.3 stop improvement in color depth. We’re waiting for the assessment on the new Panasonic Lumix DMC-LF1 from our labs to see just how well that will fare, but it too has a 1/1.7-inch type sensor which appears unable to match the larger Sony chip. Until such time that rivals adopt the Sony unit, or something similar (like the sensors found in the Nikon 1 cameras), it’s unlikely that they’ll be able to compete on level terms. 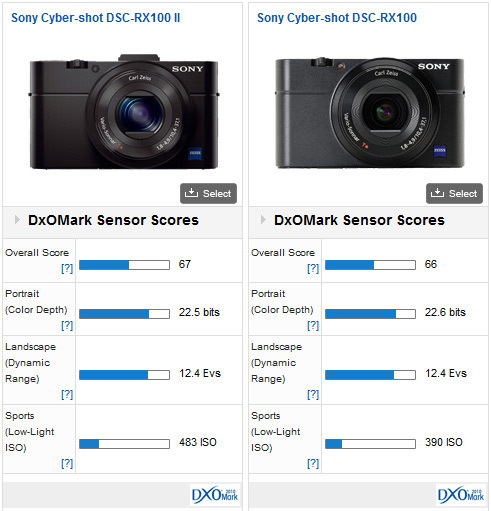 For the moment at least, the highly pocketable Sony Cyber-shot DSC RX100 and the new Mk II version have no real equal.